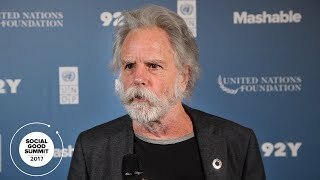 The UN Development Programme has appointed legendary musician and founding member of the Grateful Dead and Dead & Company Bob Weir as a Goodwill Ambassador. Weir has teamed up with UNDP to raise awareness and mobilize support for the UN agency’s work to end poverty while fighting climate change. Weir’s role as Goodwill Ambassador is to shine a spotlight on the important part climate action plays in achieving the Sustainable Development Goals, which were agreed upon by world leaders to protect the planet and achieve a brighter future for all. Weir will help UNDP advocate for climate initiatives and projects that promote renewable energy, preserve coastlines, combat deforestation and ensure a healthy planet for generations to come. Bob Weir accepting his appointment as UNDP Goodwill Ambassador at the Social Good Summit on 17 September 2017, accompanied by Achim Steiner, UNDP Administrator. As his first act as UNDP Goodwill Ambassador, Weir spoke about climate change and the use of technology to mobilize action to protect the planet at the Social Good Summit. Held annually, the Summit is a one-of-a-kind event that brings together leaders, celebrities, and activists from around the world to explore how a digitally-connected, global audience can join forces to make lasting progress on the UN’s Sustainable Development Goals. Bob Weir is one of the founding members of the legendary Grateful Dead, which received a GRAMMY Lifetime Achievement Award in 2007. Since establishing the band in 1965, Weir has become one of rock’s finest and most distinctive rhythm guitarists. In 2016, he received the inaugural Les Paul Spirit Award and was honored with the Lifetime Achievement Award from the Americana Music Association. Also in 2016, Weir released Blue Mountain on Columbia/Legacy/ROAR, his first album of solo material in more than 10 years and his first album of entirely original material in more than 30 years. The album received raves from critics including NPR who called the LP "stately, autumnal, metaphysical cowboy songs.” Weir is currently a member of Dead & Company which features Grateful Dead members Mickey Hart and Bill Kreutzmann along with GRAMMY-winner John Mayer, Oteil Burbridge and Jeff Chimenti. Weir was the subject of the 2015 Netflix documentary The Other One: The Long Strange Trip of Bob Weir, which chronicles his storied career. Released in summer 2017, Amazon Studios’ Long Strange Trip—Amir Bar-Lev’s critically acclaimed documentary about the Grateful Dead—is currently streaming on Amazon Prime as a six-part series. Check out some of the musician's compelling video messages in the video section below. 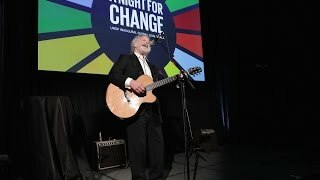 In his role as Goodwill Ambasador, Bob Weir focuses on climate action and helping keep our planet healthy and prosperous for future generations.